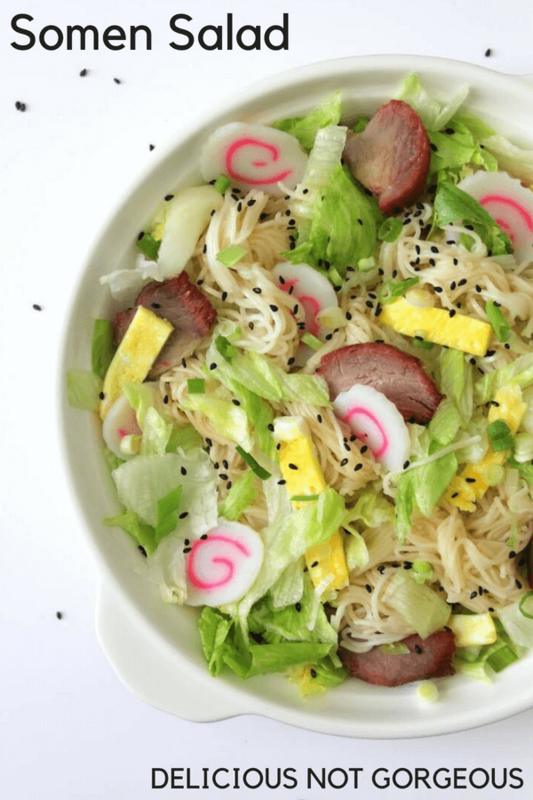 i think of somen salad as the hawaiian x japanese version of pasta salad. it’s hawaiian in some ways too, but mac salad screams hawaiian more than somen salad. anyways, i tend to associate pasta salad with summers (and leftovers lol), so it felt like a good time to give this post, originally published in 2014, a makeover. somen is a type of skinny noodles that looks similar to angel hair pasta. because somen is really thin, it cooks fast, so err on the almost underdone side. i like to rinse it in cold water so that the cooking stops, plus the noodles are less likely to clump up together. kamaboko is fish cake. it’s very chewy and firm, and has a slight sweetness. i love it, though i think it’s somewhat of an acquired texture (the taste is pretty tame, in my opinion). i like to get the non-dyed kind shaped into a domed log, since it feels more natural, though the swirly pink ones that i used here are undeniably cuter. the egg should look like this, but most of the time i get lazy and scramble it. i like to season it with a little salt and sugar. char siu is chinese barbecue pork. it’s this fairly thin piece of pork that gets lacquered with this sweet sauce. 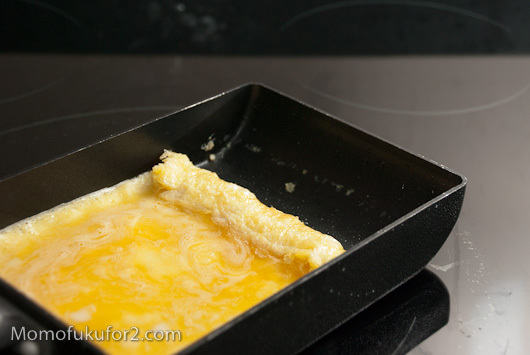 the sauce caramelizes during cooking and creates a really nice crust. you can find it at chinese stores with prepared food sections, like ranch 99 (also: ranch 99 or 99 ranch? i know it’s the latter, though i continue to use the former). you can use ham, but i highly suggest going for the char siu. 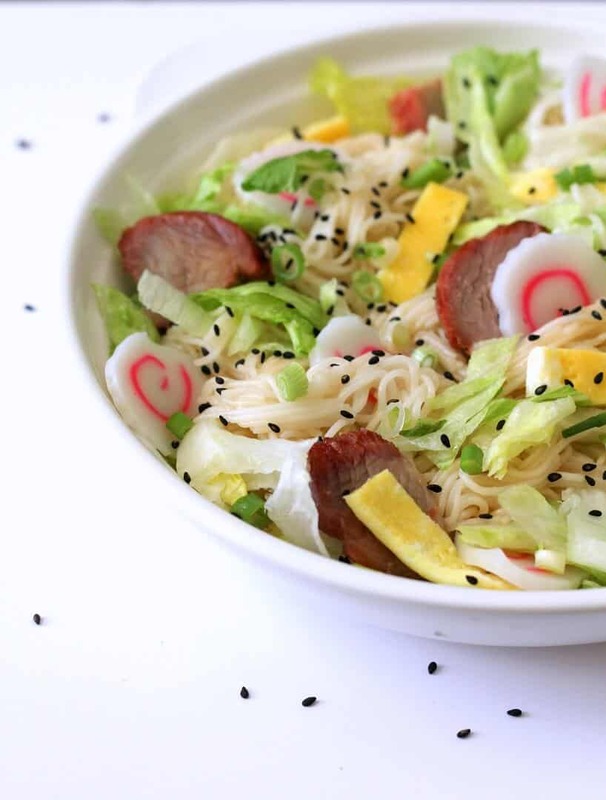 want a vegetarian somen salad? sub out the kamaboko and char siu for marinated tofu, or aburaage, the marinated fried tofu that, when stuffed with rice, makes inari (footballs!). kamaboko and char siu are pretty flavorful, so keep that in mind when you’re adapting this (aka no plain chickpeas, please). 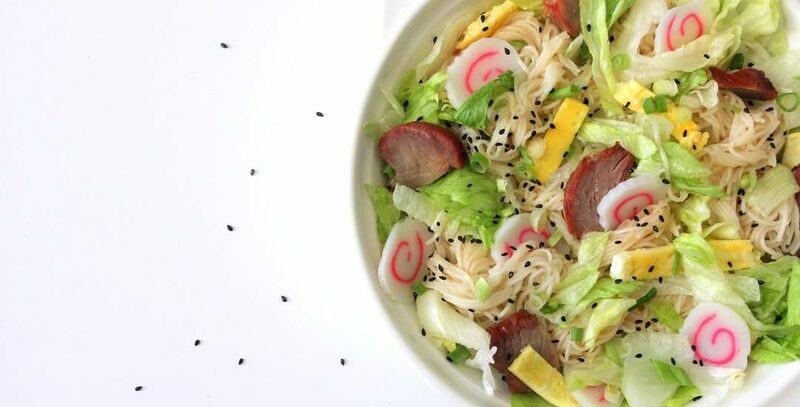 somen salad isn’t super healthy; kamaboko is processed, and there’s noodles involved. the involvement of a good amount of protein and some lettuce leads me to label this as healthy-ish. you could make this more vegetable heavy: i’m thinking arugula, zoodles, sauteed kale, shredded carrots, julienned bell peppers, etc. or you could sub in a healthier protein: maybe some roasted chicken, or shredded deli turkey. there’s two ways i typically present somen salad. option #1 like you see here: you can place the noodles in a dish (usually a roasting pan), layer over the toppings, and pour the dressing over. i like this layering method when i’m bringing it to a potluck or gathering. option #2, say if you’re having dinner at home or cooking for family: you can toss everything together. it’s faster, and equally as tasty. Somen salad is a Hawaiian and Japanese pasta salad, made with somen, thin Japanese wheat noodles. Mix all of the somen salad dressing ingredients in a jar. Toss the salad ingredients together. Add as much somen salad dressing as you;d like and toss to coat. You can eat it immediately, but I like to wait a couple hours so that the dressing soaks into everything. If you're making it more than 3-4 hours in advance, I'd hold off on adding the dressing so that the lettuce stays crisp. This salad! So colorful and pretty Heather! I absolutely want a huge bowl of it. Pinning for later! Happy Monday!! Heather, this salad is so beautiful! I imagine its flavor, so tasty – sweet/savory/tangy! Oh yum! Thanks for the recipe! 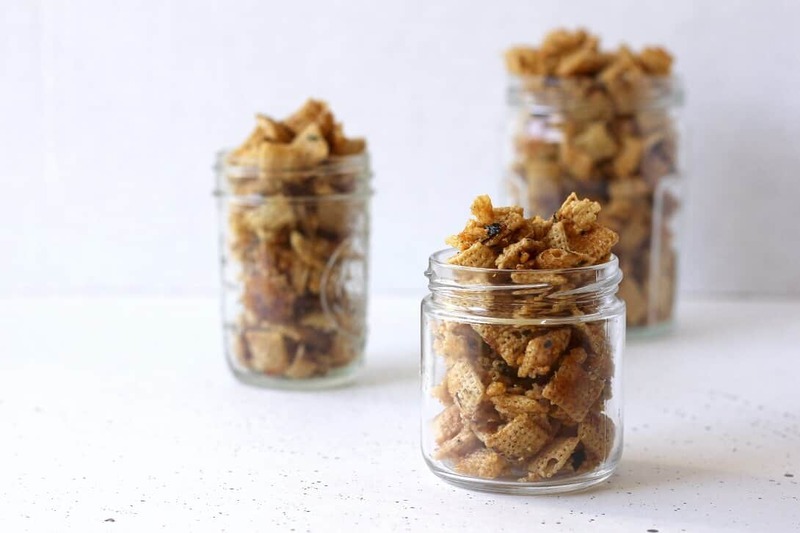 When I saw the photo I was so very curious about the ingredients and all I can say: beautiful ! This could be my perfect office lunch ! Thank you ! thanks! i honestly don’t mind wilted lettuce lol but if you do, then i’d recommend adding the lettuce on top and mixing right before you eat. What an interesting salad that I have a feeling I would really love. I bet that ham brings LOADS of flavor to it!! I’ve never tried somen noodles, so I’ll have to keep an eye out for those at the grocery store. In the meantime, this salad looks delicious! Love a good homemade dressing too! This looks delicious, Heather! It makes a perfect light tasting summer meal that I can enjoy again and again. I love the touch of sweetness the kamaboko imparts (and it looks so cute too). I associate pasta salads with summer too! This looks really tasty and would be lovely to have for a light lunch. This sounds great, a really interesting mix of ingredients. I’d love to be tucking into a bowl for lunch! This looks so good! I could eat this at least once a day! I love your somen salad recipe! 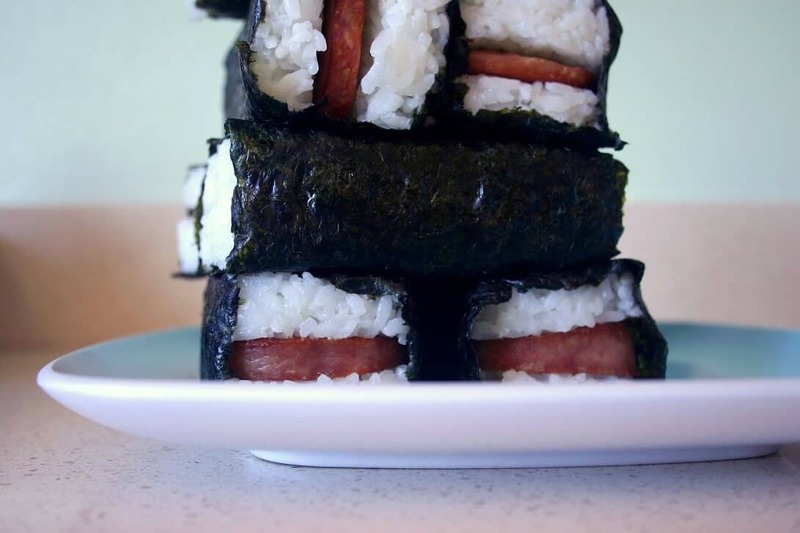 It’s interesting that you’ve combined the two cuisines – it makes sense to me, haha. I love thin noodles! Don’t get me started on char siu either. That’s my addiction, aha. SAM WOO IS THE PLACE! JK. Love your presentation! i had to google sam woo real quick to make sure you were talking about the place i’m thinking of- i haven’t had char siu there but i remember it being really tasty! it’s been a few years since i’ve been, mostly because tasty garden was always open later lol. pretty colorful, simple, interesting and refreshing. I love your recipes. 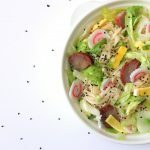 I haven’t tried this traditional salad, but a fresh salad is a must for me for lunch especially in the summer. not totally sure it’s traditional (; it’s tasty though!